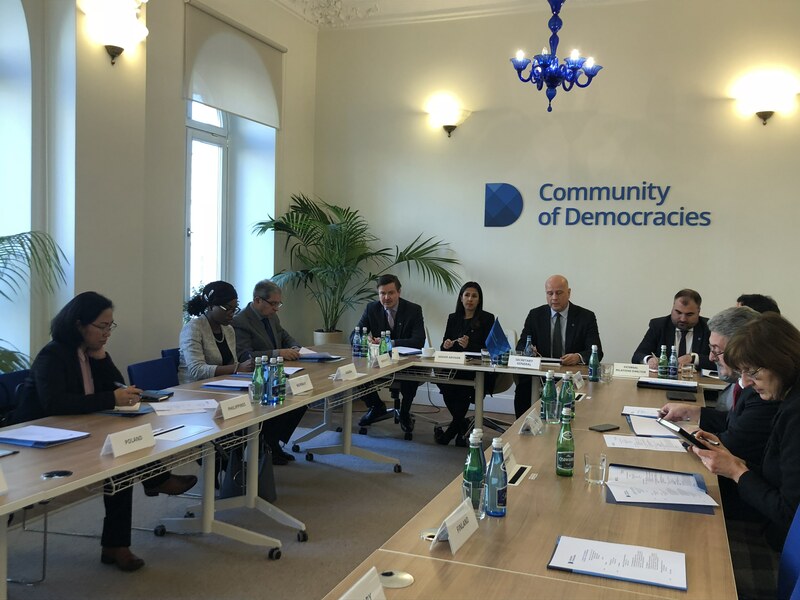 On January 22nd 2019, the Permanent Secretariat of the Community of Democracies hosted a briefing for Warsaw-based ambassadors of the Community’s Governing Council Member States. The briefing took place a week before the Governing Council session on 28th January in London, to provide the Ambassadors with an update on the Community’s current and planned activities, which will be discussed at the Governing Council meeting. Secretary General Thomas E. Garrett welcomed the guests and outlined the Community’s work in relation its Strategic Objectives for 2018-2023, including dialogue among Member States on democracy-related challenges and solutions, and providing sustained support for democratic consolidation in transitioning countries. Senior Advisor Patricia Galdamez provided an overview of the Community’s current projects and activities, including the CoD’s engagement in the World Forum for Democracy; new publication on best practice of the CoD’s Governing Council Member States’ engagement with and protection of civil society; and strategic partnerships with like-minded international organizations.